The Vulcan Model 3-1750A (230V 50/60Hz) is a digital, multi-stage programmable furnace featuring an Air Exchange design. Pre-heated air is drawn through the heating chamber using an exclusive air venturi exhaust design. The result is that combustion gases are more rapidly exhausted, increasing combustion uniformity and furnace life. The furnace is designed to meet ASTM D36174 specifications. Its digital multi-stage programmable controller allows you to adjust the rate of temperature climb with this easy-to-program option. 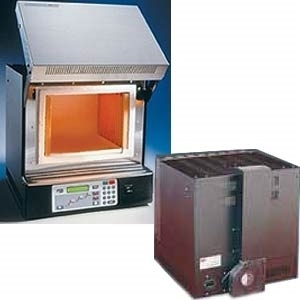 The Vulcan 3-1750A like all Vulcan benchtop furnaces have a maximum temperature of 1000 Celsius or 2012 Fahrenheit. It comes with a 2 year limited warranty. The Vulcan 3-1750A features High Performance Hybrid Muffle Technology exclusive to Vulcan benchtop furnaces for faster heating and cooling than full firebrick furnaces. It is constructed with a heavy gauge steel cabinet finished with a durable baked enamel coating.